The weather was so warm today that I walked in a t-shirt all day, a first for this year. This was the first time I had visited this part of the Peak District so, with the exception of climbing Hen Cloud, I stuck to the route in my book. There were so many rocky outcrops on my approach to the Roaches that I suspect I shall be returning soon to make the most of the new Access Land that means that they are now accessible. Weather: Warm, with high cloud disappearing as the day progressed. is Three Shire Heads. The hill to the right is Turn Edge with Cut-Thorn Hill behind it. Gibb Tor Rocks from Goldsitch Moss, one of many areas that are newly accessible to walkers. Bald Stone across Hazel Barrow. Hen Cloud, the summit of which was to be my lunch spot. 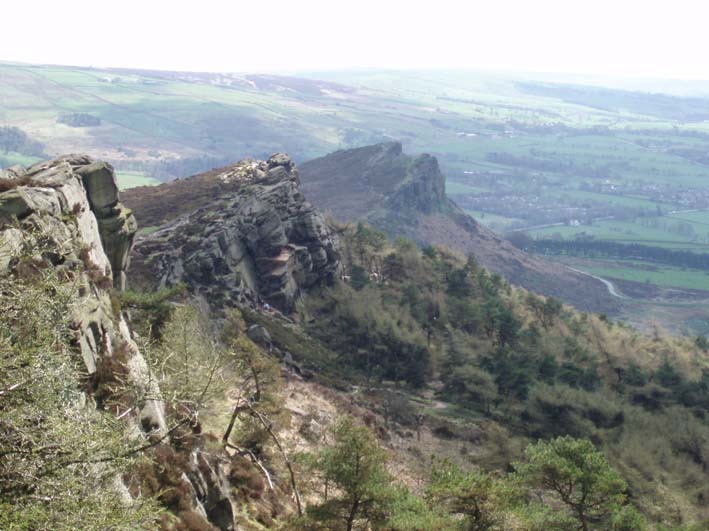 Ramshaw Rocks which are now accessible to walkers. Tittesworth Reservoir from Hen Cloud. The Roaches from Hen Cloud. A close up on Rockhall. Looking back along the ridge with Hen Cloud behind. From Doxey Pool, looking along The Roaches towards the trig point. Approaching the trig point on The Roaches, with Shutlingsloe clearly visible across Wildboarclough. From the trig point, Shining Tor is the high point on the horizon.